A group of Tibetan graduates in Machu County have staged a protest against unfair dismissals and corrupt hiring practices for public sector employees. The protestors were later detained and reports have emerged that they were subjected to beatings and intimidation. This is not the first time protests have occurred over these alleged corrupt practices. Since 2013, local Tibetan graduates have repeatedly petitioned the authorities to take action, but nothing has yet been done. Tibetans in Machu County have faced a crisis of unemployment following the implementation of Chinese resettlement programs, which have deprived many nomadic communities of their source of income. Local police later broke up the protest and detained the protesters at the county detention centre. At 3 am the next day on 9 April, the police officers summoned the parents of the protesters to the detention centre to warn them before releasing the protesters. Sources with contacts in Tibet reported that while in detention, the protesters had been beaten up and intimidated. Parents of the protesters were warned against storing or sharing any pictures or information related to the protest on their mobile phones failing which they would be jailed for three to four years. But the protesters have refused to leave the detention centre demanding that the County government head explain the reason behind the suppression of the protest and the subsequent detention and beatings of the protesters. TCHRD is unable to confirm the latest status of the protesters or whether the standoff at the county detention centre had ended. In Tibet, it is a normal practice for local Chinese authorities to impose strict restrictions on all peaceful protests. Tibetans are arbitrarily detained and imprisoned on vague or baseless political charges. As a result, the local Tibetan graduates who protested in Machu had prominently signed their protest leaflets asserting that their protest had nothing to do with politics. Their sole purpose behind the protest was to air their grievances regarding the employment problems faced by local Tibetans and the corrupt practices of the local government authorities. According to the handwritten protest leaflets, the protesters who had worked for three to four years in the public sector such as the forestry department said the authorities dismissed them from their jobs citing inadequate educational qualifications. Calling on the general public to support their cause, the protesters had provided three reasons for holding the protest: 1) Except for a handful of the selected candidates (who took over the jobs of the protesters), the rest are poorly-qualified possessing not more than primary level education, but they were hired because they had paid bribes and used backdoor connections; 2) Candidates from outside the area were hired using backdoor connections and other unfair practices; and 3) Selected candidates had resorted to unfair practices during the selection test such as using substitutes to write their tests. This is not the first time that Tibetan graduates have staged peaceful protests against corrupt government practices in providing employment in Machu County. On 10 April 2013, a group of Tibetan graduates had protested in front of the County government office. Their protest banner: “Stop outside graduates! Hire local graduates!” The protesters had complained in their petition that government officials were resorting to corrupt practices of accepting bribes and abusing their authority by allowing outsiders to steal the opportunities meant for local graduates. For years since then, local Tibetan graduates have repeatedly petitioned the authorities but no action was taken. Machu County was among the first Tibetan areas to be subjected to thetuimu huancao (“removing animals to grow grass”) policy under which the Chinese government forced Tibetan nomads to relocate to urban fringes and sell their herds, all in the name of protecting the sprawling grasslands. Many Tibetans see this policy as a pretext for the Chinese government’s urbanization policy and resource extraction. For instance, between 2004 and 2006, local authorities relocated some 9293 Tibetan nomads in Machu County. The problem of unemployment for Tibetan college graduates should be viewed in light of the intensive nomadic relocation and resettlement programs that were implemented with no thought given to the future economic prospects of local Tibetans including former nomads and their children. The erstwhile nomads who earlier had their land and herds to fall back on for security were forced to sell their animals and expected to fend for themselves in a cash economy with little or no support. In this scenario, many former nomads are left with no option but to become dependent on government handouts. Last year, in its work report on the implementation of the 12th Five-Year Plan, the Machu County government claimed that it had made available 2032 public sector jobs. But the recent protest by local graduates in Machu tells a different story. 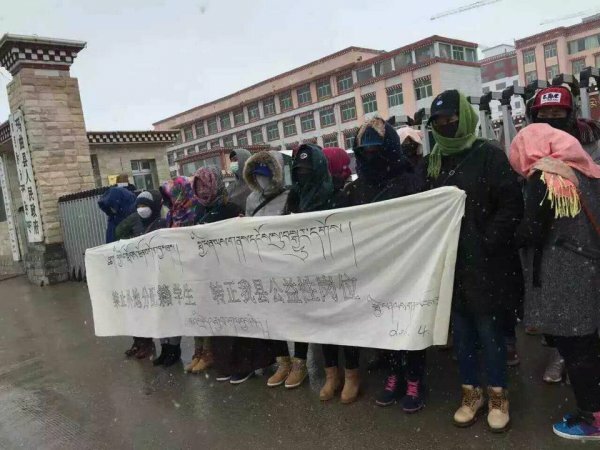 Protests by local Tibetans particularly Tibetan graduates will become more frequent unless the Chinese authorities put an immediate stop the implementation of a development policy that is ill-advised and unsuited for local conditions in Tibet. The current Chinese policy of using Tibet extensively as an extraction enclave and encouraging Chinese migrants to move their base to Tibet has had negative impacts on Tibetan lives and livelihood.